my Name is Carsten. I am living in the north of Germany ( Hamburg region). I started to read this website very carefully during spring this year. That was the time when we almost finished my Jeep and I was looking for the correct markings etc. The decission to rebuild it as a medic Jeep was made some years ago, because I am a training medic and I spend a long time in a volunteer fire brigade. So I prefer curing instead of damaging. After we finished the Jeep in the end of May this year (offical technical check and legal registration) we put her on a trailer and went to Normandy. The test drives have been made about 1300 km away from home. Which was really good fun but also ended up in a lot hours doing "moonlight fixing". The next steps will be to find some stretchers / litter and build a stretcher holder and to get my personel gear complete. I really appreciate all the knowledge in this forum and on the website. It helped and will help me a lot on the way to create a propper medic Jeep which is looking authentic instead of showing off dozens of bags and dressings . Last edited by CarstenA on Tue Aug 12, 2014 23:07, edited 1 time in total. Welcome to the forum. Please help yourself to the information available and share what you can. Sounds like you have completed a great project. Any pictures you are able to share? Have you found plans or a design for the stretcher carrier yet? I believe as they were field modifications that the designs were idiosyncratic to various units. I thought I had some references but can't find at the moment. Maybe someone else has designs? Welcome aboard! I'm sure that you will have a great time here. We have some very knowledgeable members, and all of them will be glad to help with any questions or queries that you might have regarding your restoration. 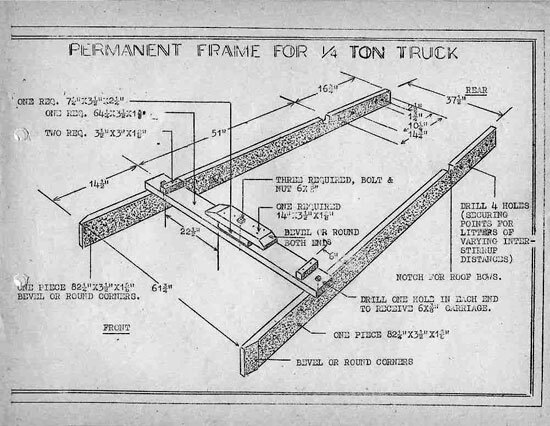 Regarding the Litter Racks for Jeeps, we have some basic sketches in our WW2 US Army Litters Article, which I've attached herewith. I hope that they might be of some use to you. thank you for the kind welcome. Ben, thank you for the pictures of the litter support. I already know them. I had the plan to use one of these and put the spare wheel towards the passenger seat. In Normandy I got one of these german style barbed wire poles which the first allied forces used to build the wire cutters and attach them to the front bumper of the jeep. I will try to post a sample pic here. So now I will try to add both. Wirecutter and litter support in the front. 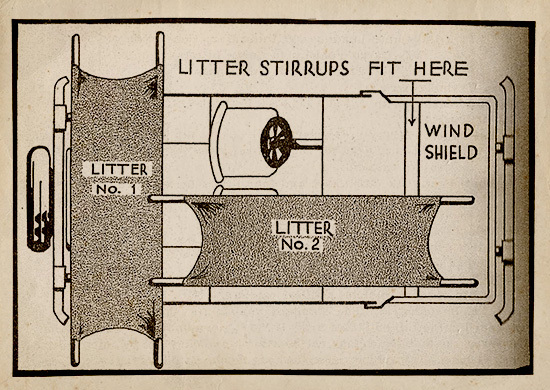 And the litter support as shown in you drawing in the back. I have seen drawings of this litter support build of branches instead of timber. If I find it I will attach it later. Honestly spoken that will take at least another one to two years until its finished.